The official release of the K2 blackpearl Migration Utility is here. The K2 blackpearl Migration Utility is used to transfer and manipulate data from existing K2.net 2003 databases to K2 blackpearl databases. This enables you to seamlessly start new and continue the execution of all currently running K2.net 2003 process instances on K2 blackpearl. It requires the K2 blackpearl 0807 release with the KB000370 update, both of which are available on the Customer Portal. For installation and subsequent migration, we urge you to look at the documentation prior to attempting either! Unless you have already tested with pre-release versions of the K2 blackpearl Migration Utility, it is imperative that you evaluate your K2.net 2003 processes and test the migration in a non-production environment before attempting to migrate production servers. Please use the customer portal to open support tickets and/or contact your local support offices to report any issues. 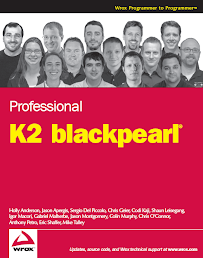 Additionally, the K2 blackpearl public forum on K2 Underground is available for community-based discussions: http://k2underground.com/forums/default.aspx?GroupID=21. Note: K2 Underground is a community Web site and should not be used for production support issues or for logging bugs. When to use a SharePoint List?